A young entrepreneur, Ralph Mendez, had been trying to get into big time business for many years and was finally ready to unveil his first state of the art restaurant, which he hoped would catapult him onto bigger and better challenges. Set on three floors, Restauranta Mendez was capable of seating up to 300 guests. It had four large banqueting suites on the top floor, a bar area on the ground and first floor, a large, beautiful garden area and a comfortable reception area. The restaurant had been fully booked for the grand opening the following night and members of the press and several celebrities were planned to be amongst the guests. Ralph had invited his friends and family along on the night before the grand opening, to enjoy the restaurant in all its glory. Also there was the head chef and one of the junior waiters. The meal itself was a seeming huge success and everyone appeared to be impressed at what Ralph had achieved. However, later that night, a call came through to the local police station, a body had been found at Restauranta Mendez and it appeared to be murder! The police were on the scene within minutes, sealed the restaurant and held the occupants, pending the arrival of the famous police office, Detective Inspector Sammer. What guilty secrets were people hiding, who would resort to murder to keep those secrets hidden and most importantly, can Detective Sammer bring yet another killer to justice? 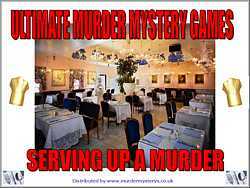 All will be revealed in Serving Up A Murder!